News of Innovative Securities - A new, contradictory era of the dollar? With Donald Trump’s inauguration, a new, contradictory era of the US Dollar may have begun. In the past decades, presidents refrained from making clear statements about the US Dollar but the new Administration seems to be different and that can lead to a new situation. According to Trump, these countries are also devaluating their currencies to be more competitive, and the US must take steps to change the current situation. An OECD survey also points out that the euro is nearly 25% undervalued, the yen is 11% undervalued, while the Mexican peso is undervalued by 147%. Since Trump’s inauguration though, peso is constantly strengthening despite the rather harsh words of the American President against Mexico. But the USD is not only strong because of its trading partners. 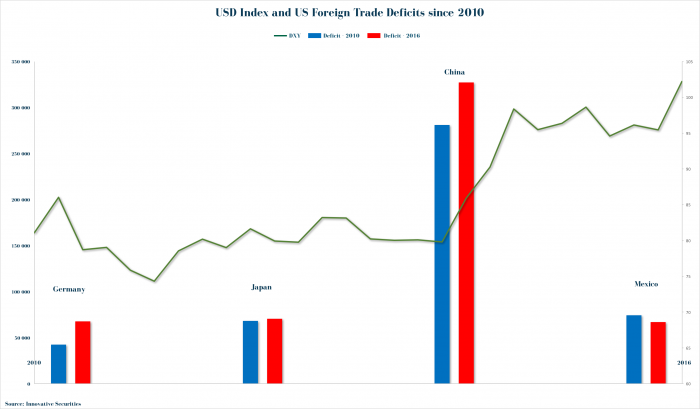 The US is still one of the most beneficiary player of the globalisation via multinational companies and we can see that since 2010 the USD strengthened constantly while trade deficits remained the same or grew. The US also has a huge import demand for its domestic consumption totalling up to 70% of its GDP. What’s more, Trump’s unofficially announced domestic tax cuts, deregulation and infrastructure investments can further strengthen the dollar. Even the desired stronger US economy, different monetary policy and the rising bond yields are favouring the greenback. 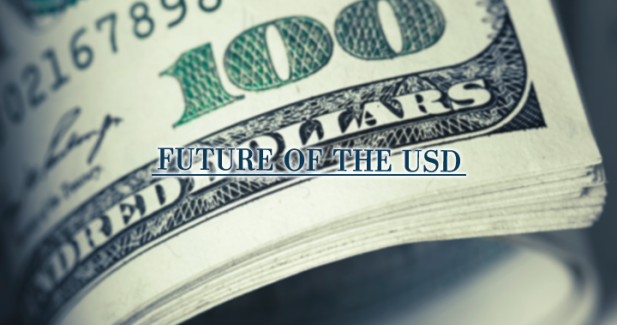 The markets recognise the conflicts between the facts (that helps the dollar) and the words (the comments that are negative for the USD), and actions are needed to clearing the picture. In the upcoming months markets will concentrate on the loosened fiscal policy and the evolving inflation which this may lead to a lot of bullish mix that supports the dollar in the near future. In the middle term, though, we can expect a turnaround. The contradictions may stay for long, and a more volatile market environment may come, where old policies are eliminated while the Trump Administration continuously tries to make verbal interventions in favour of their policies.